This rustic, mountain style house plan features a mixture of materials on the exterior including shake, siding, and stone. The exterior of the home exudes a relaxed rustic style that is welcoming with the expansive covered front porch. Inside you will find an open concept great room and kitchen that provides plenty of room for entertaining or family time. 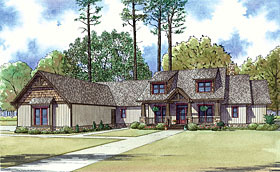 The spacious master suite features a large bath, walk-in closet, and an optional door to the expansive grilling porch. The opposite side of the home features 3 additional bedrooms and 2 more full baths. A large three car garage, laundry room, and mechanical room complete this house plan.